In Detroit, he is known simply as "The Captain." Steve Yzerman wore the "C" for the Red Wings for 19 seasons, more than 1,300 games, helping bring the Stanley Cup to Hockeytown three times and carving out a legendary career for himself in the process. Yzerman ranks sixth all-time in career points (1,755), seventh in assists (1,063) and eighth in goals (692). As a consummate playmaker, that final statistic may come as a bit of a surprise. One of the best distributors in NHL history was also one of the League's best finishers, despite never thinking himself much of a scorer. "I was able to score, but I never considered myself a goal-scorer," Yzerman told NHL.com. "The natural scorers are the guys who, it's on their stick, it's off their stick and in the net. 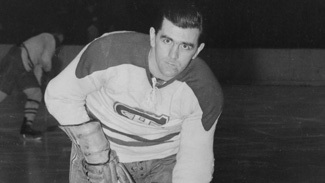 [Mike] Bossy, Brett Hull, Maurice Richard, they all had wicked shots. I was more of a playmaker." For all Yzerman's modesty, nobody scores nearly 700 goals in the NHL without a keen eye for net. Like his cohorts in the 500-goal club, Yzerman wasted no time racking them up. In 1987-88, his fifth full season, Yzerman recorded his first 50-goal campaign. The next season, he scored 65 and added 90 assists, career highs in both categories. "Once they start going in, yeah, the goal looks a lot bigger," Yzerman said of that '88-89 season. "You know, you don't think a whole lot; you get the puck and you shoot it. There's not a whole lot that goes into when things are going well." Those two seasons were part of an astonishing run of scoring for Yzerman, who scored 331 times between 1987-88 and 1992-93. His production dipped during the next couple of seasons, but by the 1995-96 season, Yzerman was nearly inhaling the rarified air of 500 regular-season goals. Fittingly, he crossed the threshold by scoring against the Red Wings' bitter rival, the Colorado Avalanche, and their future Hall of Fame goaltender, Patrick Roy, on Jan. 17, 1996. After Roy fought off an Yzerman wrister from the slot, Yzerman raced in to follow up his own miss with a backhand past a splayed Roy. It was his 906th regular-season game. Only 10 players joined the club in fewer games than it took Yzerman. "We had a great rivalry at the time -- Patrick was one of the top goaltenders in the League at the time -- it was nice to get the goal against a Hall of Fame goaltender," Yzerman said. "I guess I would just say it was a special goal and a significant milestone. "It was something that accumulates over the course of time, and you don't put a ton of thought into it until you get close to it." 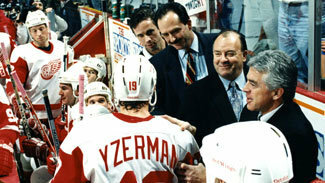 Steve Yzerman is congratulated by coach Scotty Bowman and the rest of the Red Wings' bench after scoring his 500th NHL goal on Jan. 17, 1996. Leading into the game, Yzerman said it was less about the individual mark than preparations for another Red Wings-Avalanche grudge match. "I don't really remember leading up to it -- more so it was a Detroit-Colorado rivalry," Yzerman said. "We were playing against a really good team and the goal just kind of happened in the course of the game. Obviously, being on 499, we had a stretch of home games there, so I was hopeful I would get the score before too long." The best was yet to come for Yzerman, who followed No. 500 with winning the Stanley Cup in 1997, 1998 and 2002, a Conn Smythe Trophy in 1998, and a lifetime of Motor City affection. And while Yzerman holds steady near the top of the all-time goal-scoring charts, nearly 150 goals ahead of Maurice Richard, he acknowledges the singularity of the Rocket's achievement 39 years prior to his own. "(Richard) played in a fantastic organization with great players, but he was clearly an elite goal-scorer," Yzerman said. "He stood out above the others for a long time."